This hematite ball blackline ball closure ring is a stylish alternative to regular BCRs. The ball is carved from hematite, a natural gemstone with a dark grey metallic finish and a great shine. This blackline BCR can be worn in almost any piercing and comes in a variety of sizes to suit your needs. 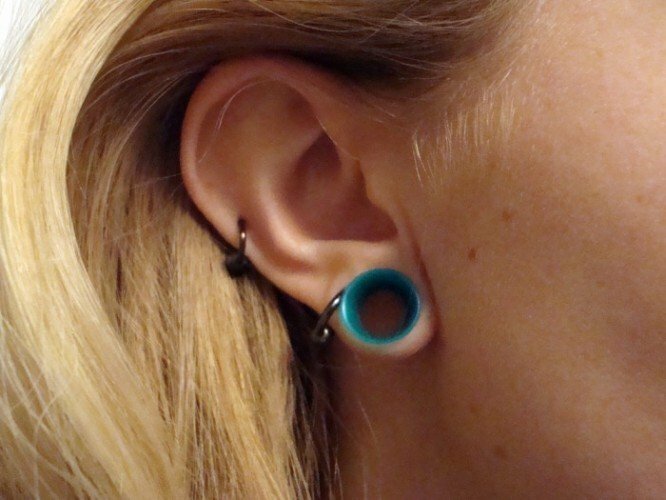 Blackline BCRs are extremely biocompatible and great for your piercings. They won't irritate your piercings and can help to reduce healing times, especially if you have experienced irritation or soreness with other piercing jewellery materials. I discovered I had a nickel allergy after I got both my helix and navel pierced with the piercer using surgical steel jewelry. I took really bad reactions and was worried about having to remove the jewelry completely and loose the piercings,that is until I found this little gem. I'm in love. 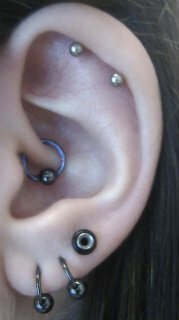 It's such a comfortable fit in my helix and I have practically no reaction to the metal used, except of course when I lay on it for too long. Would definitely recommend and in fact I use black line for my other sensitive piercings. Simply love these blackline BCR's! They look stunning in, I wear them in my lip, septum and ears, and I always get compliments on them. My bf liked them so much also bought for him too. They're the best BCR's I've worn, so easy not fiddley and very secure and lightweight, plus so cheap considering the quality!!! This product is one of the best sturdiest pieces of jewelery on the site , rings always look great but this jet black ring with a great looking hematite ball you wont fail to be noticed. P.S. Body Jewellery Shop ships extremely fast. I'm in the US (obviously international for England) and the shipping says "allow 6-12 days." I got a confirmation e-mail that they had been shipped on Monday, and I got them in the mail the following Friday! Simply amazing shipping!! Love Blackline it looks good, its comfy and I found the Hematite ball easy to get in and out, didn't need to use any ring opening pliers. This ring is so comfortable and really easy to put in. I think I've found my favourite lip ring!